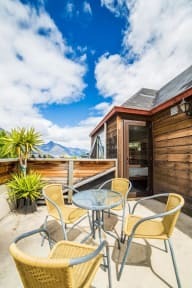 There is no availability for Adventure Queenstown Hostel on your selected dates. Thoroughly enjoyed my stay, if all hostels were as good as this one... backpackers would be very happy! Only slight criticism was WiFi was a bit slow. But apart from that very clean and tidy and kitchen had everything! Easily one of the best hostels I’ve stayed in. Everything you need and more. Will 100% be back. Best hostel I’ve stayed in. Very recommend. I think this is the best hostel I’ve stayed in! Super comfortable beds, clean and modern kitchen and great areas to hang out and talk to people. I got shown around the hostel when I got there and the person showing me around was really friendly. I had a great stay and wish I stayed longer than two nights. This is a really really good hostel! Such a great place!! The absolute best location- walking distance to everything in Queenstown. Very modern community area, kitchen and patio, & also very cozy. Great view from patios (right outside rooms). Great atmosphere too- planned events every night from movies to trivia and bar crawls on the weekends. Mostly younger people here, but also a nice mix of older ages, which makes things diverse. Only complaint is having a room that shared a wall with the kitchen...quite noisy very early & late. Had a fantastic stay at this place. The staff is super friendly, it's clean, pretty good kitchen, nice balcony and comfy beds :-). really cozy, home-y hostel! my bed in the 5 bed female ensuite dorm was very comfortable and the bathrooms were nice and modern. the kitchen is small but very nice as well. and perfect location right in the middle of queenstown, but not in a noisy spot. would definitely stay here again! Lovely hostel. Everything was clean, the bathrooms were nice and showers were good. There’s definitely cheaper hostels but this was comfy, clean and in the middle of town. Staff are friendly and reception will lend you gopros, ipads etc. Which is fab. The doors don’t lock automatically so the room is open a lot of the time but there’s lockers to use for important items.